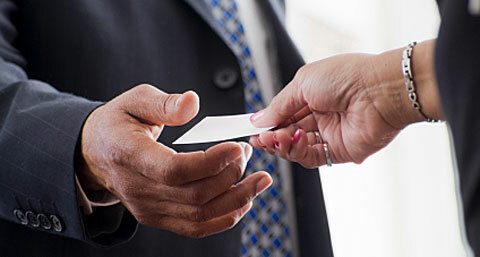 A business card is one tangible proof that you are indeed a business owner. As old school as it may seem, nothing seems legitimacy than seeing your name, title and company printed in thick and colorful card stock paper. And finally, you’re at a networking event, all excited to hand out your business card to everyone you meet. But after handing out all the cards, what happens next? Do they get in touch with you? Do they become a client? If your prospect has your card — as well as your competitor’s card — how can you make sure that the prospect contact you? Chances are, the conversation ends after you hand them your business card, and you never hear from them again. This is where a well-planned business card gives you the advantage. Your business card must have something in it that would create an interest in the prospect to contact you — and jumpstart the business relationship. A business card is an essential branding tool for your business. It can be a tool to generate interest, get conversation going, generate more leads and have prospects contact you. If you know how to use it, your business card has the potential to get you new business and prompt prospects to take action. Unlike other marketing assets such as a brochure or a website, business cards have limited real estate. You need to know how to make use of the small space to turn it into an effective marketing tool. Your business card must go beyond giving the prospect your contact information; rather, it needs to be designed to move your prospect to contact you. Start by making the card look professional — hire a graphic designer to help put your marketing objectives into print. Then make sure that it has got just the minimal information that is required to prompt a prospect to initiate an action that can culminate to a sale. Most business cards include titles. Your card may say, “Business Owner”, “Consultant”, or “President”. What does this tell prospects about what you can do for them? Titles only give people a vague idea of what you do and rarely explain how you help people. If you include a title on your card, make it descriptive of your role in the company or your work with clients. Instead of or in addition to your title, put your marketing message on the card. This is a one-sentence description of how you actually help clients. It can be the tag line that speaks about your unique selling proposition (USP). When prospects read your card, you want them to know the type of problems that you solve, and how you can help them or someone they know. Your card then becomes a catalyst to conversation and gives you an opportunity to learn more about this prospect’s needs. Another way to use your business card to pique prospects’ interest is to include an offer on the back. You might offer a free report or guide of interest to your target market. For example, if you are a real estate agent you could offer an article on “10 Simple Ways to Increase the Value of Your Home”, available on your company’s web site through the link provided. When prospects visit the site, ask them to provide their name, email address and phone number, and then deliver a well-written and informative article. You can ask people to visit your website and give them a discount for subscribing to the newsletter. (This serves two purposes, you get a client base to inform about your new products and services at the same time the your prospective customers became aware of your web presence). You can also ask them to engage with you in the social media, by following you on Twitter, following your Facebook page, subscribing to your channel on Youtube or connecting with you on Linkedin. This will help fortify your connection with the prospect and give you more opportunity to convey your message. Whether you are selling online or operate a traditional store, you can use specially-designed cards offering discounts on repurchase to first time customers. This can be highly effective to entice them to return to your store and increase customer loyalty. You can have a small survey at the back of your business card and ask the people to fill it up and submit back to you or your shop and they are eligible for some discount or prize based on a draw on those surveys. At the same time, when they come to return you those survey cards, don’t forget to give them a new business card without any survey. Your business card can be an important step to help you build relationships with customers and prospects. If you can keep the above factors in mind while designing your business card, you have just employed one of the most effective sales agent for your company.